This free advanced ESL lesson plan is the first of three lessons on The mind. It contains classroom activities and games that teach students how to describe the way themselves and others think about the world. And don't forget, if you use an iOS or Android device, you can get offline access to these materials through the TEFL Handbook app. 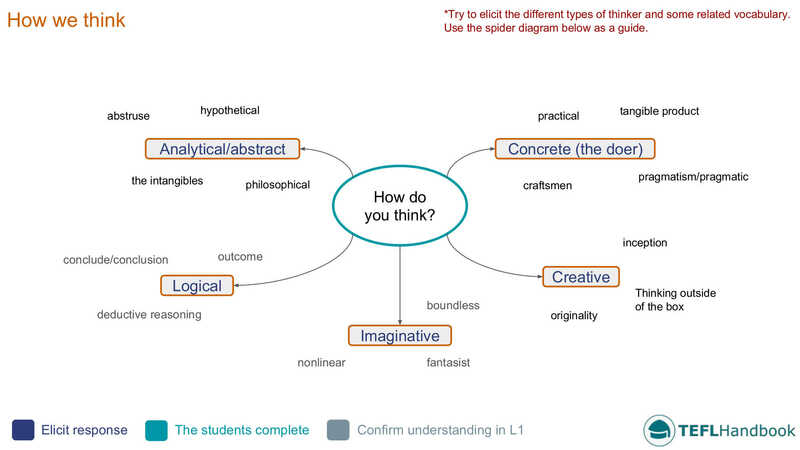 Elicit adjectives that describe the different types of thinker. 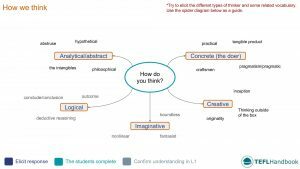 Add any concepts or vocabulary that you feel are relevant to the level and use them to drive a discussion in the classroom. Refer to this spider diagram as a guide. A speaking activity where students have to speculate on their partner's thinking style, as well as their own. Working in pairs and using the vocabulary from the board, students have to select three adjectives that best describe how they think and three for their partner. Inform them that they will be asked to explain each choice. When finished, students will share their picks with the whole group, before hearing what their partner has to say about them. After a student has listened to their partner's thoughts, ask them to comment on them. Do they agree? Are they surprised by any of them? A fun follow-on activity that you can do when students have access to smartphones with the internet. If there are enough smartphones in the class, have the students work in pairs to complete a couple of online tests which attempt to tell you what type of thinker you are. When they have finished, discuss their findings as a group. Have your students search for the two tests below. 2. Which Of The 6 Types Of Thinkers Are You? If you don't have the resources available in the classroom, assign this as a homework task and have the students report back as a warm-up activity for the next lesson. This speaking activity has students wrestle a couple of tough questions related to the lesson's theme. 1. Are there differences in the way that women and men think? If so, what are these? If not, explain. 2. If scientists could put a chip in your head that would make you twice as intelligent, would you have the surgery done? The students have a mini-debate on a statement related to today's lesson. Divide the class into two groups and randomly assign each to one side of the debate. Give them 5 minutes to prepare their arguments. At the end of the five minutes, you will chair the debate and make sure that everyone has had a chance to say their piece and respond to any counter-arguments. Make it more fun by picking a winner at the end. Base your choice on performance and justify your decision. Players have to represent abstract concepts related to the mind on the board while their teammates guess what they are. Start by dividing the class into two teams. On each turn, give the student in play an abstract concept related to the mind. That student must then represent it on the board using only images and symbols. Their teammates earn a point when they guess it correctly. We hope that you found a few of these ideas useful. If you did, be sure to bookmark our complete list of advanced level ESL lesson plans, as well as our entire collection of ESL courses.